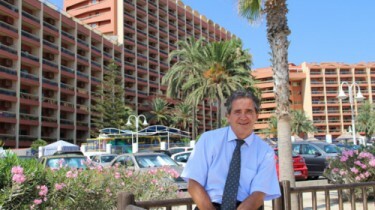 IT is easily one of the Costa del Sol’s most successful businesses. Catering for 1,900 guests in peak season – and rarely under 1,000 at any time of the year – Sunset Beach Club is one of the coast’s busiest hotels. And then come the weddings, with around two dozen in September alone. “We get over 80 a year and at €3,500 an event we think that is terrific value,” explains General Manager, Mark Wardell. It doesn’t seem much. But, of course, by the time you have factored in the guests rooms, their meals and bar spend (the majority are Irish, after all), it becomes a profitable business for the hotel. Sitting on a fantastic headland next to two lovely beaches, it is perhaps no surprise that Sunset has continued to grow every year for the last six, despite the recession. An incredibly well-run ship, the hotel – said to be the biggest on the Costa del Sol – consistently delivers to holidaymakers from all around the world…. over 50 different nationalities this year so far! And it definitely does not scrimp and save on food, entertainment – or indeed on its fantastic rooms – having spent a whopping €22m upgrading its facilities over the last decade. Without a doubt the price/quality level is one of the best in Southern Spain and the food in all three restaurants is excellent. There is free live entertainment every night, all year round in the Oasis Restaurant, which locals rave about. During the Summer, their beach restaurant ‘Luna Beach Club’, is the perfect place to chill out and enjoy some great food right on the beach. As you would expect, the resort also has a fantastic pool and playground area for kids, and a convenient poolside snack bar. In the summer there are organised activities day and night including shows and tribute bands in the Moonlight Show Rooms – which is arguably the best entertainment venue on the coast. Make sure to check out their online Events Calendar at www.sunsetbeachclub.com for details of all live events, many of which have free entrance. But there is so much more, when you factor in the supermarket, a hairdresser, fitness facility, shops and on-site Leisure Desk where you can book golf, excursions, and tickets to local attractions, as well as pick up a wealth of useful local information. There is even a Padi dive school by the pool, where you can learn how to dive in a great value day’s beginners course, which ends up looking at fish and octopus around the nearby rocky headland. Yes, there is a lot going on at Sunset Beach hotel and the statistics speak for themselves. The 554 rooms and communal areas are looked after by a team of up to 69 cleaners, who process a staggering 450,000 kilos of laundry every year! The Food and Beverage team meanwhile counts 71 staff who work tirelessly in the various outlets from a la carte dining, poolside snacks, lobby/cocktail bar, beach bar, beach club, show rooms and banqueting. Then there are up to 12 ‘animation’ girls and guys whose sole purpose is to make young and old guests alike have a fun-packed visit.